It can feel frustrating to invest time and money into getting dentures, only to feel challenged by eating, drinking and speaking clearly after the procedure. As much as possible, try to be patient and remember that this initial period of learning how to function with dentures is temporary. Within a few weeks, you’ll be able to eat a wider variety of solid foods – just make sure to cut everything into smaller pieces. Also, it’s not uncommon to have gum tenderness at first, so it’s a good idea to remove your dentures about every 3-4 hours to give your tissues a break. You can also swish with salt water a few times each day to help soothe your gums. You might think that all denture adhesives work the same, but each one has differences in texture and consistency that appeal to different people. Take the time to experiment with the adhesive that you like the best. You’ll be using it every day, so it will be worth the effort. Your tongue, lips and teeth have been working together for a long time to help you speak clearly, so it’s natural that it will take a little time to perfect your speech after getting new dentures. One surprising trick is to sing throughout the day for the first few weeks. Try to sing your favorite song slowly and smoothly and you’ll be back to speaking clearly again sooner than you think. It’s important to follow your dentist’s instructions after you’ve had your extractions (and throughout the entire denture process). Doing so will help your tissues heal better and faster, which will make your adjustment period much easier and more comfortable. Also, don’t hesitate to contact a dentist in Lacey if you’re experiencing any problems. They can advise you on what to do at home or might recommend that you come in for an adjustment. 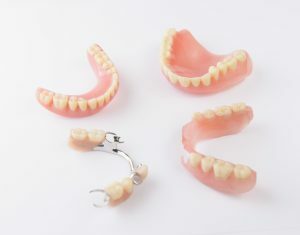 Dentures are a wonderful way to restore both your smile and self-confidence. By using these 4 tips and tricks, you’ll be able to get the most out of them as soon as possible!